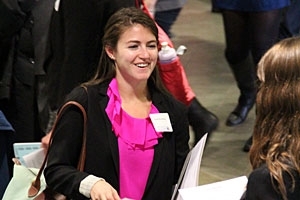 A student meets with a potential employer during the 2013 Marketing and Communications day hosted by the Kogod Center for Career Development. For the third year in a row, the Kogod School of Business has moved up in its ranking on the annual Bloomberg BusinessWeek "Best Undergraduate B-Schools" list, even as several regional competitors have seen declines. Kogod placed No. 56, up from No. 58 in 2012, out of 124 ranked undergraduate business programs. Twenty-one schools were not eligible for the ranking due to insufficient response rates to required surveys. "We remain committed to providing our students with an education that is rooted in understanding business fundamentals and enhanced by extensive experiential learning opportunities," said Dean Michael Ginzberg. "It is encouraging to see our efforts recognized by our students, employers, and peers. Kogod is an extraordinary place for students to learn and excel." This ranking is based on surveys completed by graduating seniors and employers, as well as data points provided by the school. The 2013 surveys comprise 50 percent of the overall ranking and are combined with results from the two previous years. Kogod ranked No. 35 in the Academic Quality category, which contributes to the overall ranking. This is based on a combination of factors, such as student-faculty ratio, average SAT scores of students, and the percentage of students with business internships, a historically strong measure for Kogod students. Surveys by 85,000 graduating business seniors, including Kogod students, determined Kogod’s 2013 Student Survey ranking of 44. The rankings also combine information from 519 polled corporate recruiters, data on median starting salaries for graduates, and the number of graduates each program sends to top MBA programs. Kogod offers five undergraduate degree programs, including a BS in Business Administration; Accounting; Finance; Business, Language & Culture Studies; and Business and Music. The school also draws a respectable number of students who choose to pursue business minors from across American University’s campus.